Want to create a One page website with WordPress? Great, this is just the right place to find amazing One page templates. 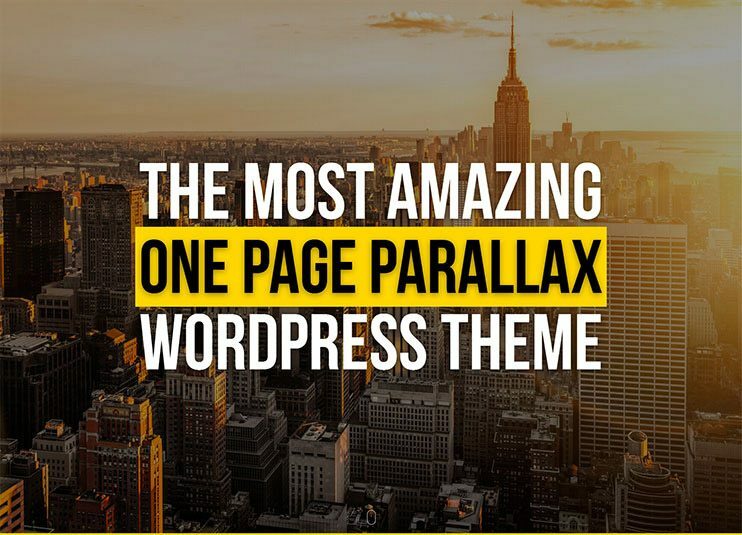 This article contains the list of some of the best WordPress one page themes. You can pick up the best one and create a stunning and feature rich One page websites. 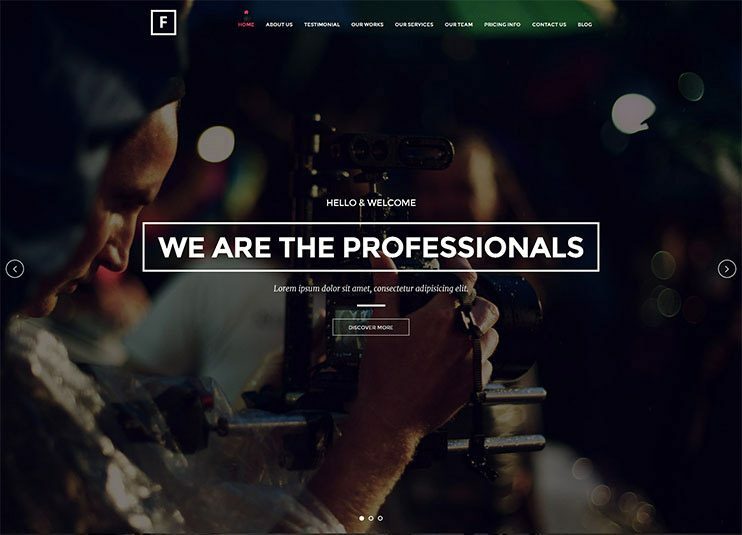 These One page websites are elegant and allows easy navigation to various sections. The list contains some multipurpose as well as special purpose themes. So, you’ll probably find a perfect fit theme from this list for your website. These are premium theme and they come with proper documentation and other guiding materials to help you setup your website. The themes are easy to use and highly customizable. They have enough options to let you customize your website and make it look and work the way you want. So create elegant, feature packed, easy to use and wonderful website using the One page WordPress themes. Select the best and get started now. OnePager is a one-page portfolio theme that allows you to showcase all vital information on your homepage. Editing the content is made easy with the use of widgets and native WordPress menus; both of which tie into the theme beautifully. 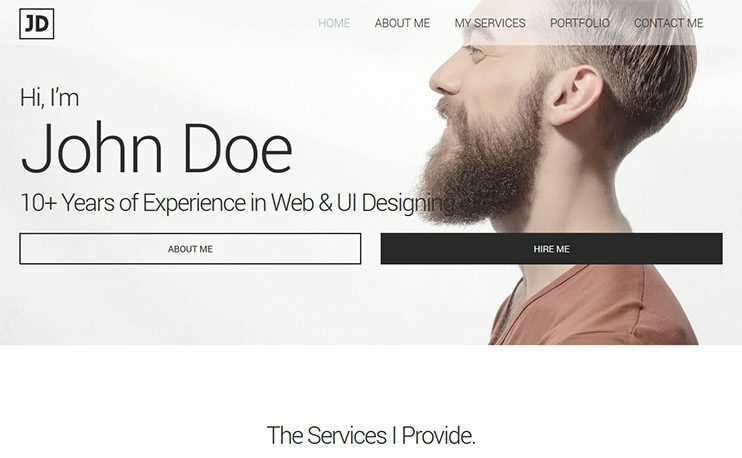 The theme has a modern design to let you create One Page website in 2018. 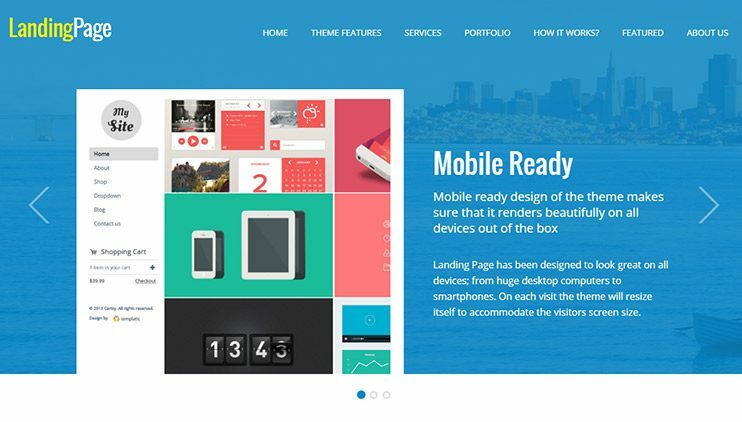 Landing Page is a sleek multi purpose WordPress theme that you can use to showcase any type of product or service. Making this happen are extensive portfolio features as well as full compatibility with the free WooCommerce plugin. To top it off, this WordPress landing page theme comes with a big focus on homepage management. Pretty much every piece of content can be appended to the homepage! 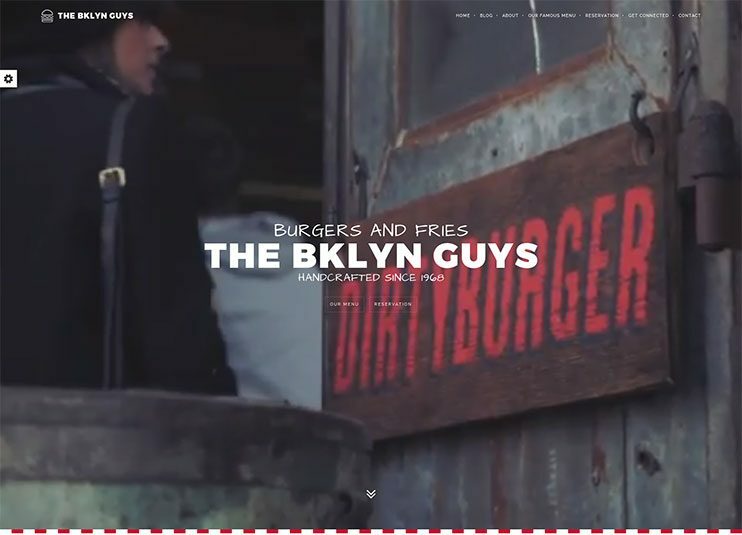 Brooklyn is a multipurpose One Page WordPress theme. You can use this theme to create a website of any kind with easy and flexible options. There are more than 20 demos to choose from. You can create page designs using the Visual Composer page builder. You can make changes about how the theme behaves using the options available in the admin panel. 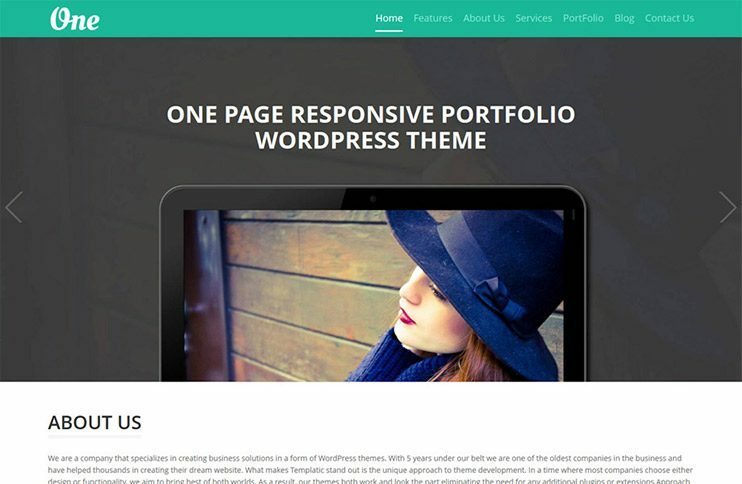 With this theme you can also create and display beautiful portfolios. 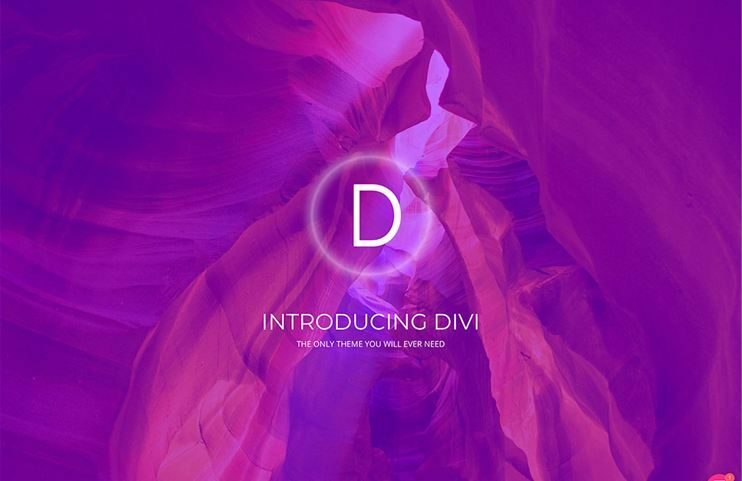 Divi is a multi purpose and feature rich theme. It is extremely easy to use and very flexible. 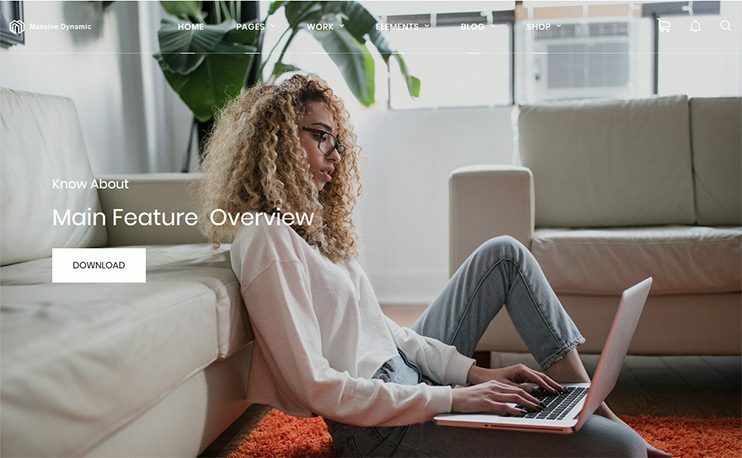 With this theme you can create an elegant One page website of almost any subject in 2018. There are some demo designs you can choose from. The theme works on the base of the drag and drop Divi page builder. You can arrange the content blocks and make your website look and create unique designs. You can customize your website using the Live Customizer. The theme comes with an admin panel with well organized and grouped setting options. 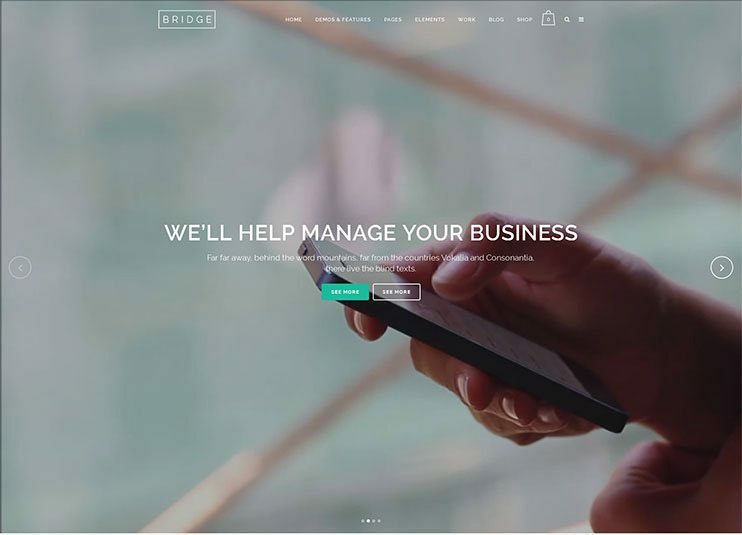 Bridge is another multi purpose theme in the list. It is designed to let you create beautiful One page websites as well as landing pages. Create amazing pages with the drag and drop Visual Composer page builder. You can choose from abundant number of demo designs. With the WooCommerce plugin, you can have any ecommerce feature in your website. It is SEO optimized. Shore is a multi purpose theme. You can use this theme to create One Page or multi page website. It is a feature rich and flexible theme. You can choose from the available demo designs. Shore has a clean code and is SEO ready. It allows WooCommerce integration for ecommerce features or to setup a shop. For easy page building, you can use the drag and drop Visual Composer page builder. Shore is SEO optimized and has a clean code. 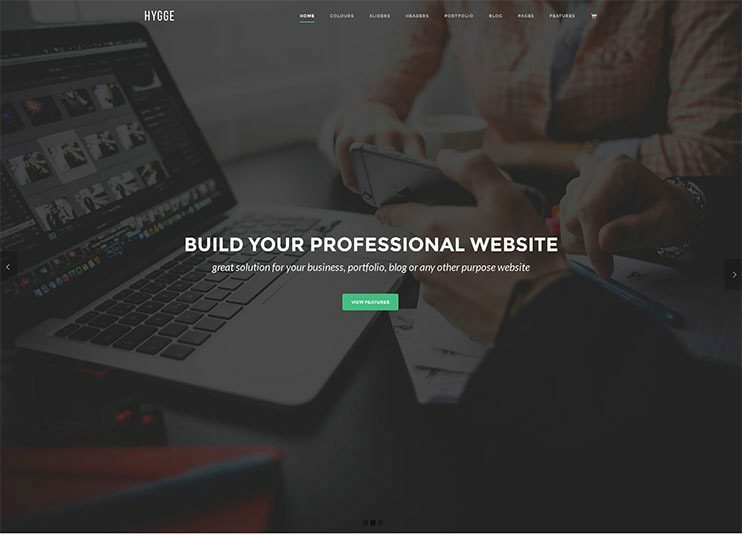 Hygge is a multi purpose theme to create an elegant and feature rich one page website in 2018. With this theme you can create a fast, performance oriented and beautiful One Page website. You can create custom pages with the Visual Composer page builder. It allows you to create amazing portfolios. You can use the WooCommerce plugin for ecommerce features. It is an SEO friendly theme. 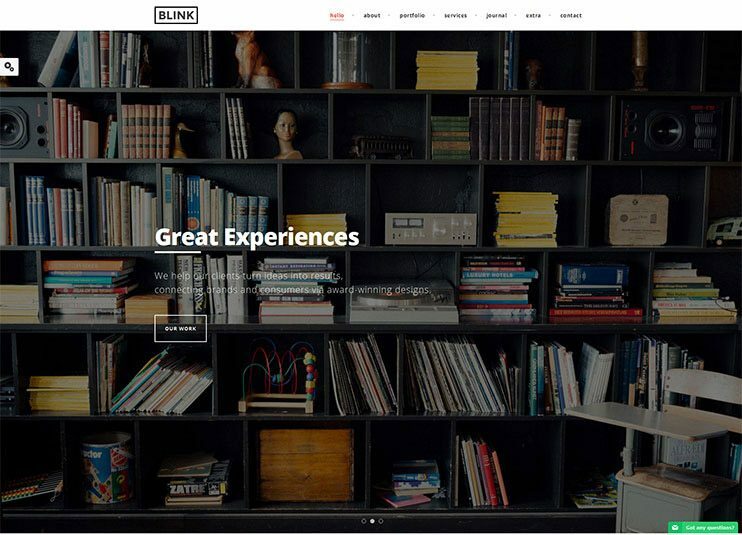 Blink is a modern WordPress One Page theme that can be used for multiple purposes. 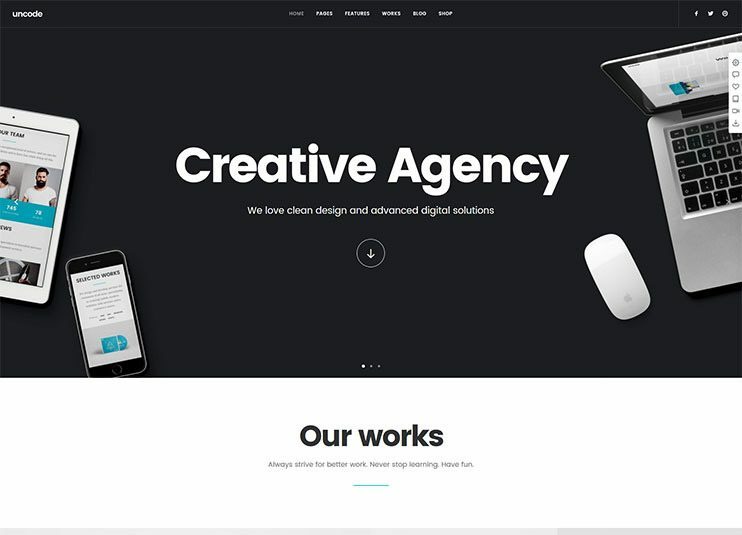 With this theme you can create a website for your creative agency or a corporate one page website. Blink is beautifully designed and the content elements are animated. You can create pages with the drag and drop homepage builder. You can use the WooCommerce for ecommerce features in your website. It is SEO friendly. The admin panel has powerful options to manage how the website behaves. 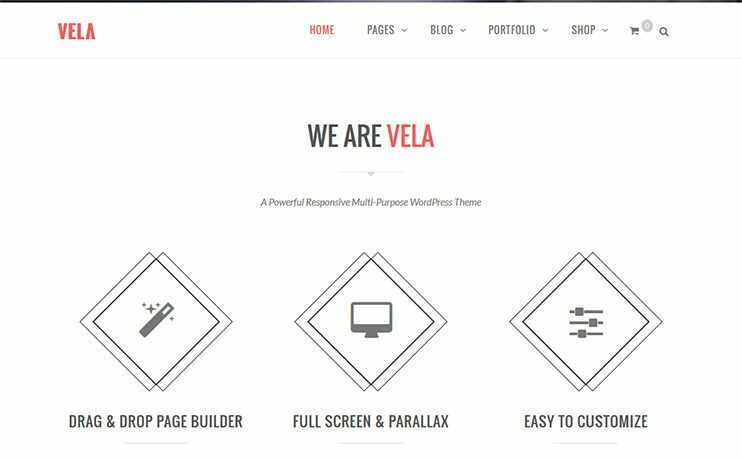 Vela is a multi purpose WordPress theme for creating a business website. It allows to create a One page as well as multi page website. There are some demo options to choose from. The theme allows creating pages with the Visual Composer page builder. You can include ecommerce features into your website using the WooCommerce plugin. There are theme options that lets you manage the website smartly. 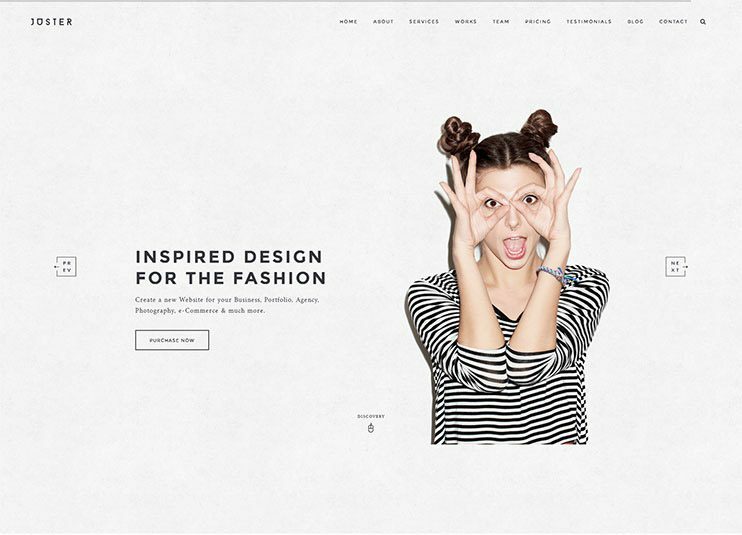 Juster is a multi purpose One Page theme. It is a manageable and highly customizable WordPress theme. You can use the Visual composer to create pages with drag and drop options. There are number of pre-designed demos to choose from. You also have some pre-designed pages you can use for your website. With WooCommerce you can have the ecommerce features into your website. It is speed optimized. Jarvis is a One Page WordPress theme with attractive and eye pleasing design. It is highly customizable and flexible. It is a multi purpose theme that can be used for many purposes. You can use WooCommerce for ecommerce features in your website. There are more than 14 homepage variations. The theme comes with multiple styling options. You can try different combinations and choose the one you like. 907 is a theme that lets you create one page as well as multi page websites. The theme comes with abundant features and customization possibilities. This theme comes with some demo designs to choose from. You can use the Visual Composer page builder to create pages. For the ecommerce features and setting up eshop you can use the WooCommerce plugin. Osmosis is an SEO optimized, feature rich One page WordPress theme that can be used for multiple purposes. The theme is designed to provide best front end and back end user experience. There are a few demo options to choose from. The theme options are provided by the robust Redux framework. You can use the Visual Composer drag and drop page builder to create custom pages for your website. For ecommerce features in your website, you can use the WooCommerce plugin. 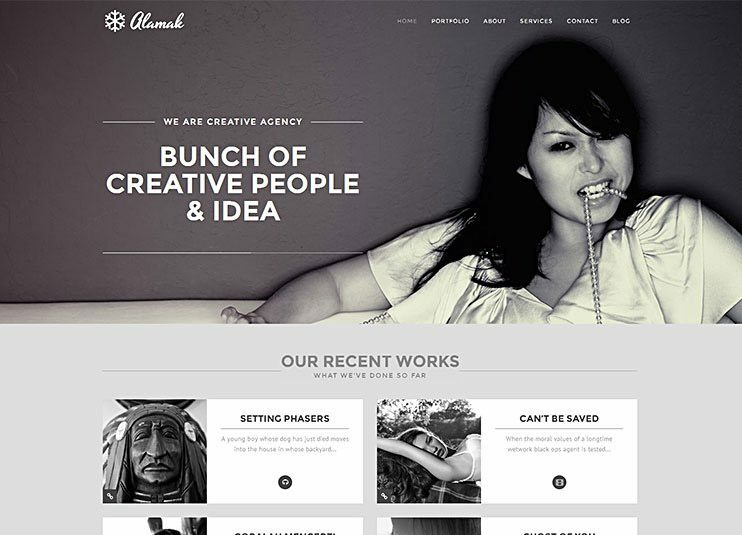 Alamak is one of the best WordPress One page themes. It has a filterable portfolio and customizable home page. You can choose from the 3 homepage layout variations. The theme is great for creating a One Page blog website. It can also serve the purpose of an Online portfolio. It is easy to use. 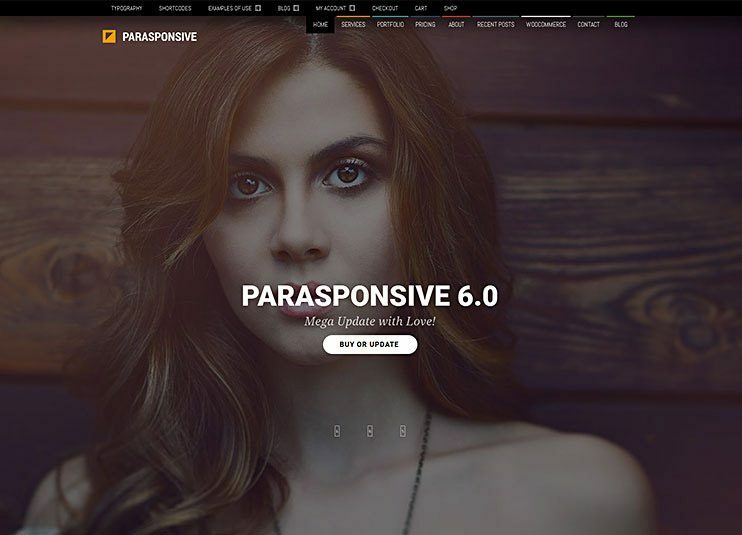 You can use parasponsive theme for creating a WooCommerce store. It is feature rich and highly customizable. The admin options to manage your website comes from the robust Redux framework. Parasponsive is SEO optimized too. The theme allows you to embed YouTube and Vimeo videos in your website. It is Social share ready. 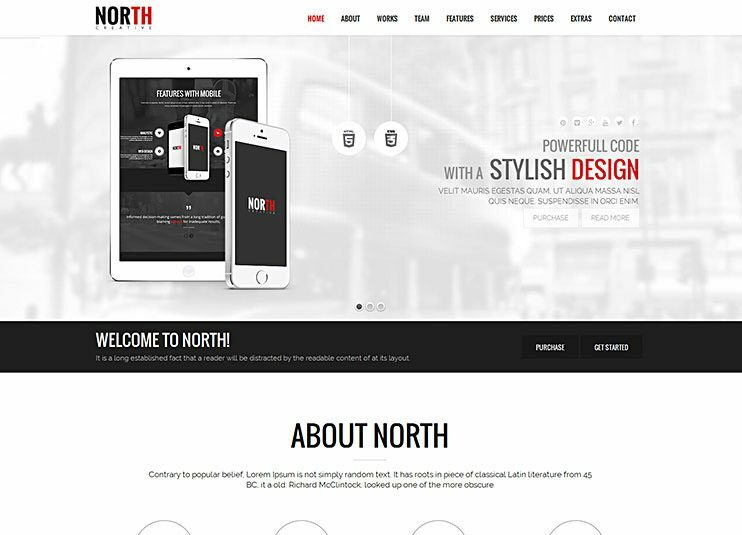 North is a feature packed responsive One page theme. It is easy to use and flexible. There are about 14 demo design options to choose from. Visual Composer page builder allows to create pages with the drag and drop options. With the powerful theme options, you can set how your theme behaves. There are enough customization options to let you manage how your theme looks. It is also compatible with the WooCommerce plugin. 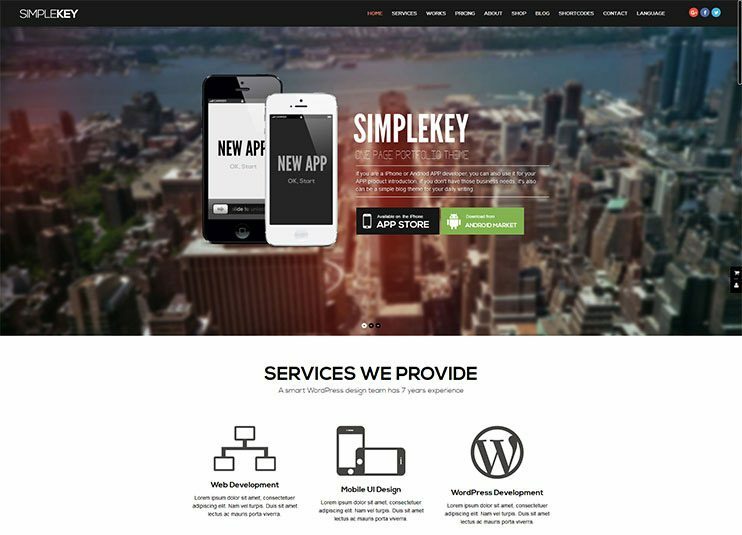 SimpleKey is one of the WordPress One Page themes with smooth scrolling effect. It can be used to create a simplistic One page creative or corporate website. With the Visual Composer page builder you can create pages with the drag and drop options. The theme allows managing your website with the advanced theme options. There are enough customization options too. You can also use the WooCommerce plugin for ecommerce features. Uncode is a multi purpose WordPress theme for One page website. The theme lets you choose from some elegant demos. You can use the WooCommerce as well as Visual Composer. This theme has a number of useful features. It has easy and flexible options for customization options. With this theme you can create website with high quality and managed images. Massive Dynamic is a business WordPress theme for one page website. There are some demo options to choose from. With this theme you can create speed optimized business one page website. It is a flexible theme with unlimited options and opportunities. You can create pages with the drag and drop page builder - Visual Composer page builder. The theme is highly customizable and the website can be managed using the advanced admin options. You can also use the WooCommerce plugin for ecommerce features. It is SEO optimized. You is an amazing One page multipurpose theme. It is flexible and feature rich. You can choose from the available demo options. The theme is highly customizable. It allows WooCommerce for ecommerce features. You can create unlimited pages with the drag and drop Visual composer page builder. You can also integrate bbPress for forums. It is speed and SEO optimized. 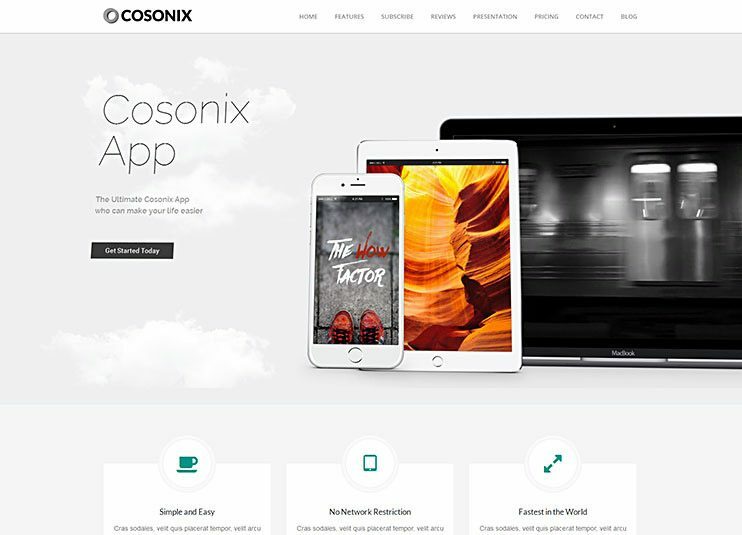 Cosonix is a one page business theme. With this theme you can create a website for promoting your ebook, app or a website for your creative agency. This theme is specially designed for startup business to make your mark on the internet. You can choose from the homepage designs. The pages of the website can be managed with the drag and drop Visual composer tool. It is easy to use and flexible. The theme has powerful setting options. It is SEO ready. 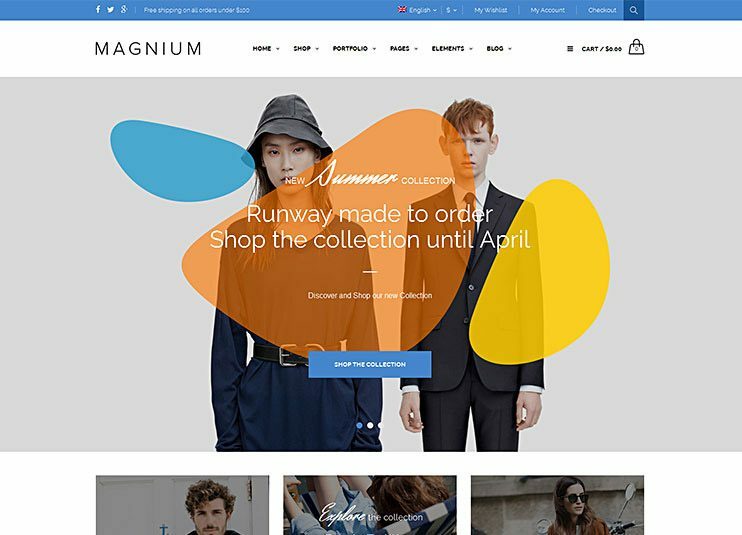 Magnium is a theme allows you to create a website to sell online or a professional business site. You can use this theme to create a multipage or a One page website. Magnium is a highly customized theme. This theme lets you choose from 14 multi concept demos. You have abundant page options to choose from. You can design your pages with the drag and drop Visual Composer page builder. It comes with WooCommerce integrated. It is also ideal for blogging and portfolio management websites. It is SEO optimized. 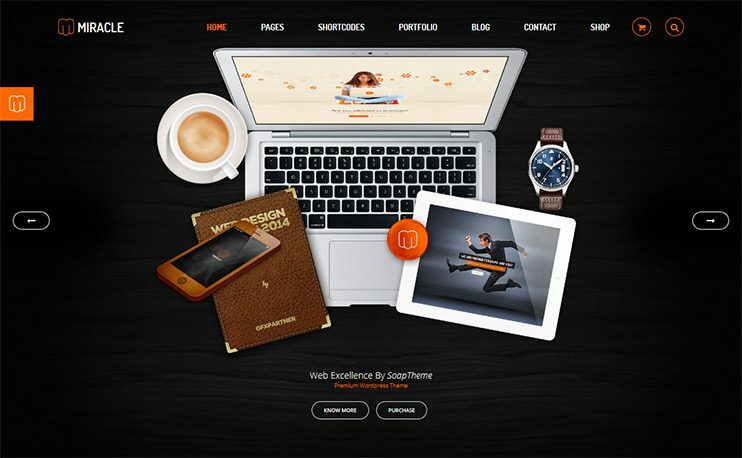 Miracle is a multi purpose and responsive theme. It has perfect design suitable for blog and portfolios. The theme is flexible and easy to use. 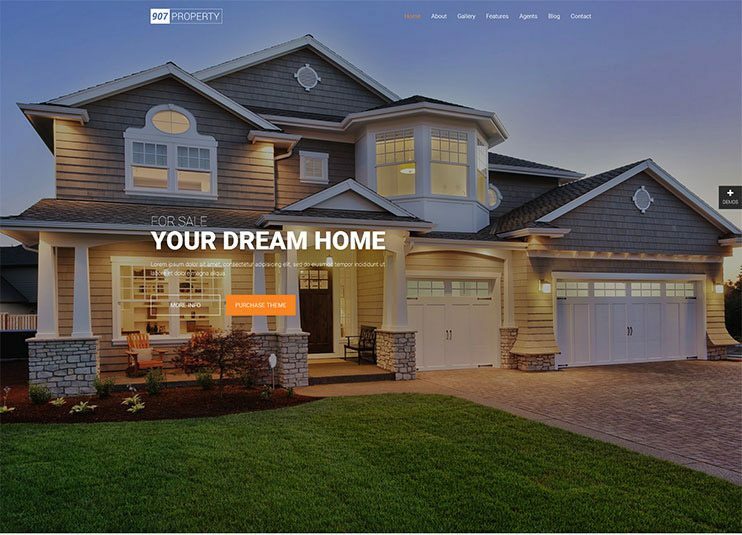 You can choose from 14 homepage designs. If you want to create shop using the theme, you can choose from 6 WooCommerce shop homepage designs too. The theme comes with elegant blog and portfolio pages. It is easily customizable and SEO compatible. 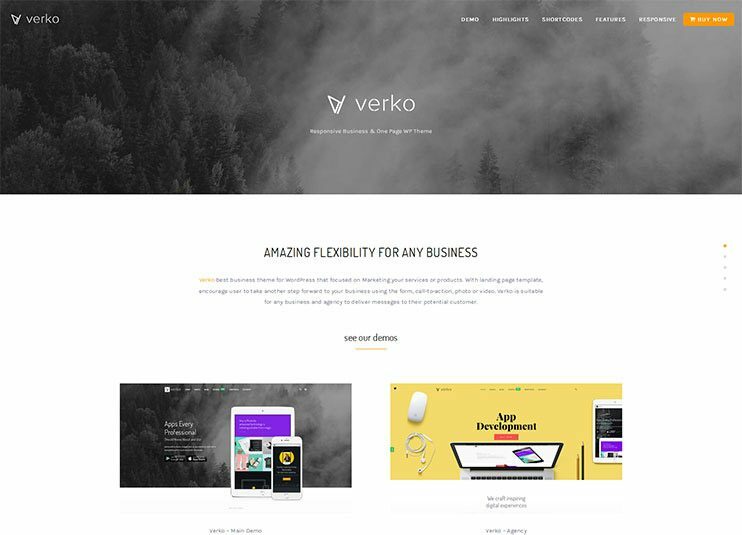 Verko is responsive business One page theme. It can be used to create website that focuses on marketing your services or products. There are some demo options you can choose from. You can choose from the drag and drop Visual Composer page builder. The theme allows customization using the theme customizer. It has a clean and SEO optimized code. 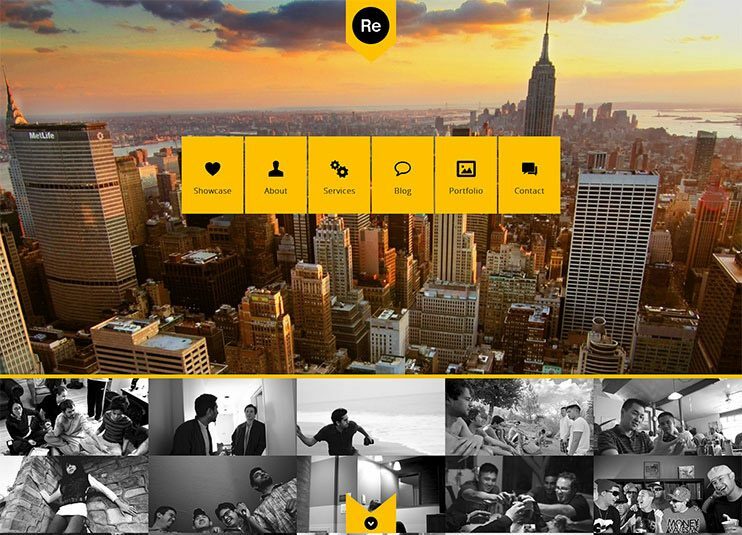 Flip is a multi purpose One page website in 2016. This theme has a unique design concept. As the name suggest, the website sections have the flip animations. It has a distinguished design and beautiful parallax effects. You can choose from the 5 demos options. It allows you to create amazing portfolios. You can choose from the available color options and Google fonts. You can also use the font awesome icons. Awesome is a business theme for creating portfolio. With this theme you can create a simple and clean business websites. The theme allows you some basic customization options and admin options to control the theme behaviour. It has built in SEO. You can use the WooCommerce plugin for ecommerce features. Renova is a One page responsive WordPress theme. It can be used to create online portfolios. The theme has a flat design. It is flexible and easy to use. With this theme you can create galleries. It has a beautiful design and a flexible layout. The theme allows to use a child theme for advanced customization. The theme also has ready to use contact and about pages. Norris is an elegant WordPress theme for creating corporate, business and personal website. The theme has an eye catching design and is very flexible. This theme comes with 14 unique homepage design options. There are many features and functionalities you can use easily. You can use the WooCommerce plugin for ecommerce features. It has a clean and SEO optimized too. 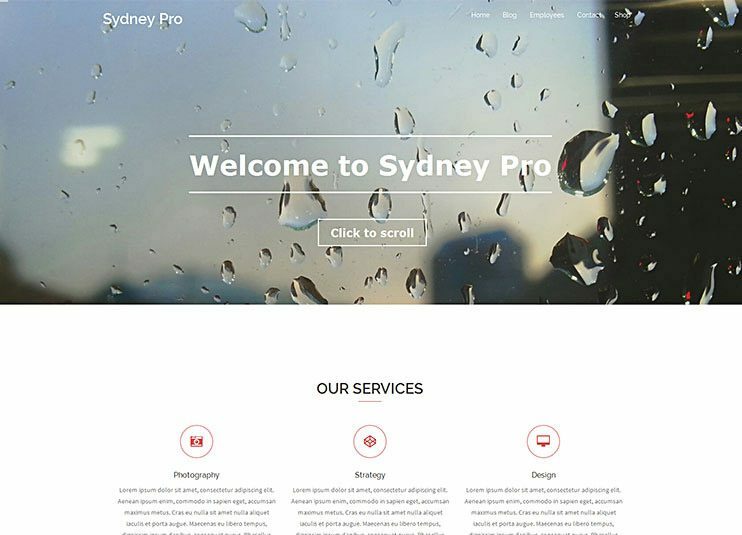 Sydney pro is based on a free Sydney theme. The Sydney theme can be upgraded to Sydney Pro for advanced features. It supports video header and is easy to use. With the WooCommerce plugin, you can get the ecommerce features into your website. You can use the live customizer to customize the theme. The theme comes with advanced widgets and pro features. There are some extra page templates too. 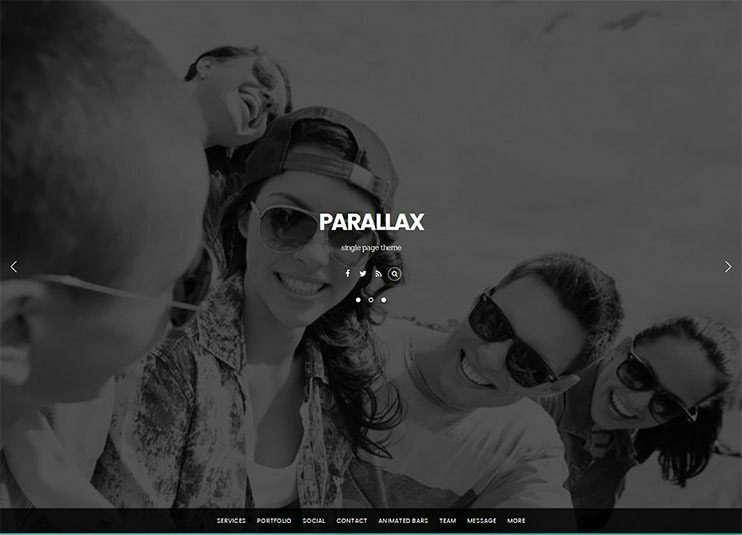 Parallax is one of the best parallax one page WordPress theme. This theme is a multi purpose theme that can be used for various different purposes. The theme comes with more than 40 pre made designs. You can create amazing portfolios using a unique post type. The theme has a feature to let you apply image filters online. There are many other options like animated progress bars, list/grid layouts, infinite scroll, etc. 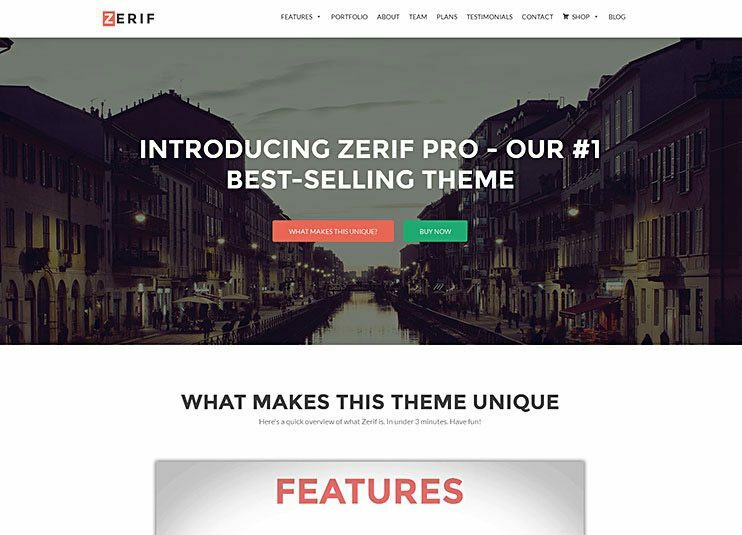 Zerif Pro is a business WordPress theme. 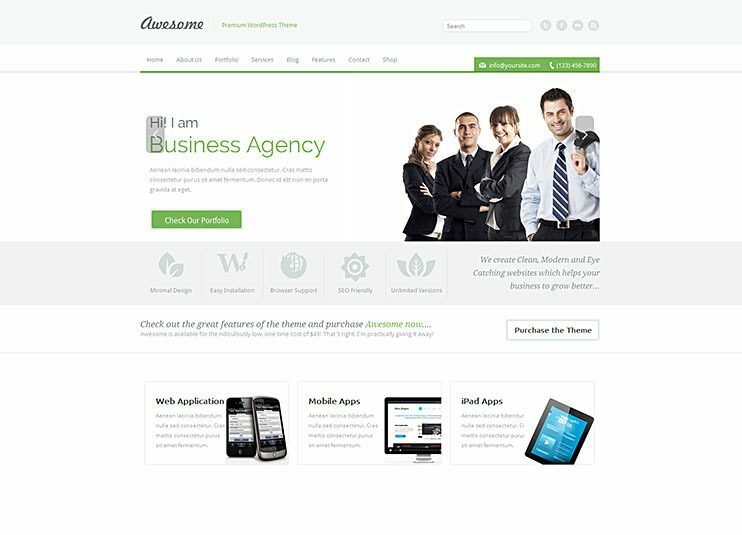 You can use this theme to create a one page business website for creative agencies and professional business websites. There are some child theme design variants to choose from. The theme allows WooCommerce for ecommerce features. You can create web pages with the drag and drop content builder. Zerif pro is speed and SEO optimized. The theme comes with a live customizer for customizing the website. 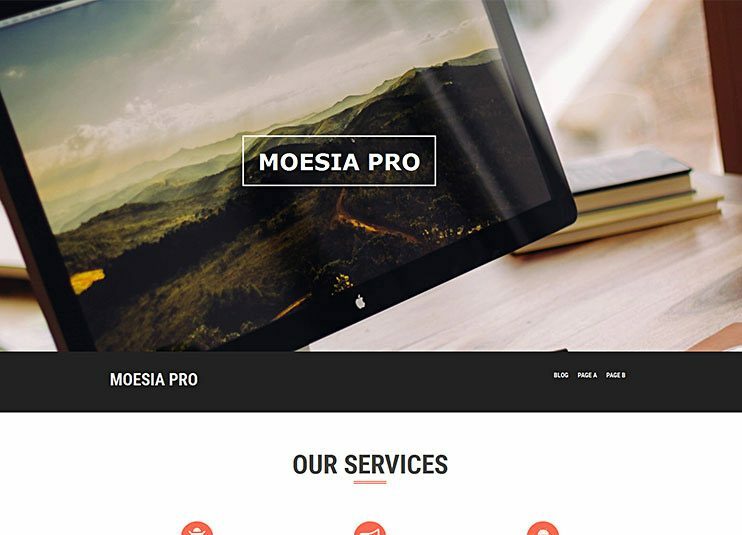 Moesia is a theme to create a multi purpose website. The theme can be used to create a professional business website or corporate website. The theme comes with extra content blocks to create pages. You can use the live customizer to create customizations. You can use the google fonts and amazing slider. Choose your favorite one page template to get started. All the one page WordPress themes listed here are easy to use and highly customizable. They come with flexible options to create any kind of website you want. With the available options, you can create a focused, and beautiful one-page website for your company, service, business or application. Pick up your favorite and get started now.